April 11, 2019 It looks like Octopath Traveler hits Steam in June. Square Enix has officially announced that the gorgeous throwback JRPG Octopath Traveler is coming to PC, but that announcement seems to have come accidentally. The company put out a blog post confirming that the game will hit Steam on June 7, but that post was quickly deleted. Of course, this is the internet, so the message was quickly saved for posterity. “We have some very exciting news for PC gamers,” Square Enix says. “Octopath Traveler is coming to Steam on June 7, 2019! So, y’know, add it to your wishlist now.” Presumably, that means the game’s Steam page is meant to go live soon, but it’s not there yet. You can read the full blog post via Gematsu, but it doesn’t provide any details on what to expect from the port. 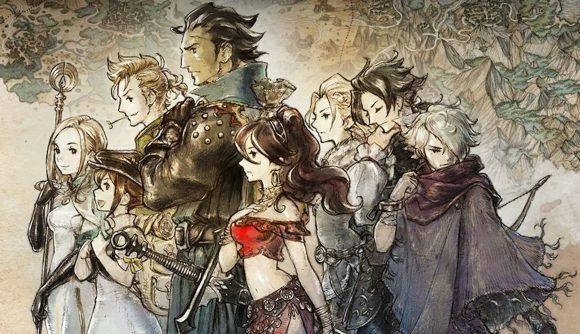 This comes after a listing from Korea’s Game Rating and Administration Committee (translated via Google) appeared earlier this month, referring specifically to something called “PC Octopath Traveler.” While the Nintendo Switch version of the game was published by Square Enix, the applicant behind this listing is Bandai Namco, suggesting that a release on PC could be being handled by a different company, at least in Korea. There are no other pertinent details included within the listing, other than the fact that the game is an RPG, and that it’s been provided a rating of 12+, neither of which are particularly surprising. While minimal attention was understandably paid to the game on PC when it launched, it caused quite a splash on the Switch. Roughly six months after launch, its developers announced that sales on Nintendo’s console had surpassed 1.5 million. Harry played the console release (although we don’t talk about that) and said that he was impressed by its “2D-HD” art style and story, although he wasn’t so keen on the JRPG grind.